Sarah Linnea Prince - Edmonton's Burial & Cremation Professionals | Trinity Funeral Home Ltd. It is with profound sadness that we announce the sudden passing of our beloved daughter, sister and tiny dancer on Saturday, June 24, 2017. Sarah will be ridiculously missed by her loving parents Dave and Linnea, sister Rhiannon (Kris) and brother Chris. They are joined by Grandma Vicki Prince, Aunts and Uncles Chris (Giselle), Barb (Paul), Arlaine, Darwin (Betty), Ryan (Susan), Roxi (Carlos) and Sylvia. 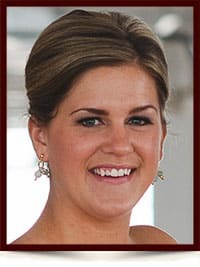 Sarah will be lovingly remembered by her huge extended family and the amazing circle of friends and co-workers she held close in her big heart. Sarah grew up in Sherwood Park and was a proud graduate of the BARST program at the University of Alberta. She was building an amazing career in event management with Buksa, the International Triathlon Union, the Edmonton Oilers and most recently, the Alumni Association at the University of Alberta. It is a sad irony that our oh, so capable planner has to rely on us to organize her sendoff. Sarah lived for activity and action, preferably outdoors. Her greatest joy was working with kids – coaching soccer with her sister, running day camps at Strathcona Wilderness Centre, camp counselling at Camp Horizon or shepherding the EnMax Energy Kids at Oilers home games. And many young NHL stars were tapped on the shoulder by Sarah to hang around after the game to receive their 3 Stars awards. Music, dance, laughter and love defined Sarah. She shared it freely and passionately with all of us. She danced like no one was watching, sang like no one was listening and loved like she would never be hurt. Her laugh, her smile, her sense of mischievous playfulness was infectious. And she infected a lot of us. Costumes anyone? We cannot make sense of this right now, maybe never. But we know that Sarah wants us to continue to aim high and keep dancing. To live proudly and with purpose and with love – ‘Armed with will and determination.. And grace too’. I know I am a little late, I was shocked when I heard the news months ago, but something has brought me here again and I still can’t believe it is real. Sarah and I knew each other, but more as acquaintances over many years. Even still, she was always such a bright sunny presence, and she made me smile every time I saw her. Sarah and I got to know each other better when my brother played for the Oil Kings and I attended every home game for 5 years – which meant I saw a lot of Sarah. She was just an all around wonderful person. I am so unbelievably sorry for your loss and can’t imagine how confusing this must all be. I know her star will be shining brightly each night and she will be watching over you all. Please accept my condolences on the passing of Sarah. I just found out and am very shocked to read this news. She was a great individual with an infectious personality. I was honored to have known her with her work on PERAA association. She will be very missed. Our deepest condolences on the loss of your beautiful Sarah. We were out of the country when we heard the very sad news, and our hearts go out to all of you! Yours is a family filled with love and joy, and Sarah’s memory will shine brightly always! Dave and Family, my deepest condolences to the entire Prince family for your profound loss. My thoughts and prayers are with you during this difficult time. Kevin and I are shocked by the news of beautiful Sarah’s passing. We are sending our deepest condolences to Dave and Linnea, Rhiannon and Chris. Sarah was such a cute little girl,a perfect addition to your family of four. We always loved the Prince family! I was heartbroken to learn about your daughter’s passing. I remember Dave to have been most proud of his roles as a son, husband and father; and he spoke about his family often. I cannot imagine the pain your family is in right now. Please know that you are loved and supported. It seems like only yesterday Sarah’s wonderful smile was greeting me as I first arrived in Edmonton as an exchange student at the end of the last decade. She was the first person I met and with little more than a note from her cousin informing her I was arriving from New Zuuland, without hesitating she took me under her wing and ensured I had somewhere to live and wasn’t left out in the cold of an Alberta January. By introducing me to you all and her circle of friends I was immediately made to feel incredibly welcome in a place far away from home with lots of weird things like chips covered in gravy and a secret coded language to decipher just to order coffee at Tim Hortons. I’ll always remember our post class brain storming sessions for controversial dress up party costumes. Much like you all I am struggling to make sense of her passing but I will always remember her for an unwavering pursuit to support others in activities she was so clearly passionate about. I’m sure as time goes on all our awesome memories of Sarah will overwhelm the current emotions of grief and sadness. We are thinking of you all and sending arm fulls of love from down under in New Zealand. Rest in peace, Sarah. Dave and Linnea – it is with deepest sympathy that is send condolences to your whole family. Be comforted in knowing that Sarah has touched the hearts of many in meaningful ways. She was a beautiful young lady. Dave – My heart breaks for you and Linnea and all of your family. I can’t even begin to imagine the pain you are all feeling. I don’t know what words of comfort I can give you but know that I am thinking of you. It was a beautiful gathering and am thankful that you have lots of family and friends to help you through this very difficult time. I am so sorry I was unable to attend the Celebration of Life for Sarah. I had the opportunity to work with, and get to know Sarah through the Strathcona Wilderness Centre. Sarah was kind, so positive, fun loving, and impressed us all by her endless energy and enthusiasm. Sarah will be missed by all. My thoughts and prayers are with her family at this time. Dave and family, I was shocked and saddened to hear of Sarah’s untimely passing. I hope the presence of family and friends bring some level of comfort and the deep love surrounding her and impact of Sarah’s life on people will ease the pain that is so acute now. I’m thinking of you and keeping you all in prayers. Linnea, Dave and family. I am so sorry for the loss of your sweet daughter. Sarah was one of the first we met when we moved up here and she was and is a treasure. She was so caring and her smile and laugh was infectious. I feel we were blessed to have known her. I thank her for taking Kara under her wing and helping her at Hosford as well as helping Kara out in the soccer world. Her passing leaves a huge hole that hopefully time will help heal. It is just not supposed to happen this way and my heart breaks for what you must be going through. Our thoughts and prayers are truly with you and may she rest in peace. Sending you my condolences at this sad and shocking time! May peace and comfort come as you remember and celebrate Sarah’s life. No words seem right, or really help, I know. My thoughts and prayers are with you all. Unfortunately I wasn’t able to attend Sarah’s service today, but I promise that I am sending you my love and prayers. Sarah – Aurora by her SWC nature name, will always light up our skies, night and day. Her positive energy, enthusiasm, and empathy were magentic, and the laughs were contagious! She was the maker of fun, always – I still smile every time I see the binders in our office, covered in pink and labeled in Ukrainian, with Cryllic script. Her smile will be in our hearts forever. I am so sorry Dave to hear of your family’s loss. I remember you talking about Sarah and how proud you were of her. She was a lovely young woman. My thoughts and prayers are with you and your family. Our deep sadness cannot begin to make us understand the tremendous sadness that is on you, this beautiful family that we love. We send our love in hope that added to everyone’s love, it will carry you through. I’m so sorry to hear of Sarah’s passing. I hope the love of family and friends will strengthen and comfort you in the days ahead. The Crimson Lake Family ( Richardson’s) are shocked and saddened by this news. There are no words that proper convey how we feel. We can only imagine how you all feel as such a close loving family you are. Sarah was the person you could find in a crowd, because the crowd was around her. She was the one that had the biggest smile on her face and always made you feel like you were the most important person in the world. Sarah touched so many hearts, mine included. Sarah will be the brightest star in the sky, rest in peace my dear. We cannot fathom your grief, shock, sorrow and sense of loss of such a bright spirit found in Sarah. No words can say enough. ‘just know she was loved and admired by all. We are here to support all of you as you navigate the future and try to make sense of this tragic loss. Big hugs. You are in my thoughts and in my prayers. I am deeply sorry for the indescribable pain you are enduring but take heart because Sarah loved you with all that she was and will continue to for eternity. I cannot put into words how sad I was to hear of Sarah’s passing. I was fortunate enough to first meet Sarah when we interviewed and hired her to join the Oilers and Oil Kings Event Team back in 2009. She was a beam of light with an infectious smile, unique wit and personality, and an unmatched ability to bring people together. A beautiful soul. I was asked to speak about Sarah at our Oilers Loyalty Awards last week. While I spoke about her personality, loyalty, and everlasting impact here with the Oilers, it will be the genuine friendships that she made that will be most cherished and remembered by all of us. She was the life of the party, a true teammate, and a great friend. She will be so deeply missed by many. My deepest condolences. Thinking of you all right now. See you tonight at Sarah’s Celebration of Life. No words will ever make this right or good or better , I couldn’t think of a happier person I have ever met in my life other then our Sarah next in line Rhiannon but Sarah came first , I will never forget her , as I think of her as my baby sister I never had and will always have a hole in my heart ❤️. I love you guys so much I wish more then anything else in the entire world that I could be there with you . All my love is sent to you . I’m so sorry to hear of this terrible news. I knew Sarah from dance years and years ago. She was always smiling and making us laugh. She was a beautiful person and I am so so so sorry for your loss! Dear David, Linnea and family, wwe are so sorry for your loss. Sarah will be missed. We are sorry we are not able to come to the celebration for Sarah, but know that you are in our thoughts and prayers. Love to you all. Dear Linnea, Dave, and all of Sarah’s loved ones. I am so very heartbroken for you in the loss of your beloved Sarah. Dave, your love for your family has always been so perceptible and I can’t imagine how hard this is for you. You have my most sincere and heartfelt condolences. God bless and support you as you carry the pain of you loss. I’m so sorry to hear of Sarah’s passing. I first met her at a wedding where she turned an awkward dinner conversation into a fantastic one, where everyone was at ease and enjoying themselves. She had such infectious energy and truly lit up the room when she walked in. Dave and Chris – so sorry to hear of your family’s loss. She has left this life too soon but I can see that her spirit is alive in all your hearts. Dave and Family. I am so very sad to hear about your loss and send my deepest sympathy. This loss is so very tragic for you and your family as you well know. I hope in time, the fond memories help ease this pain and those memories bring smiles. Thinking about you during this difficult time. Dear Dave, Linnea and your family. I am so deeply saddened by the passing of your lovely girl, Sarah. No one can imagine how you are feeling right now. I hope that the love and support of your family and friends will give you some comfort and help you move forward day by day. From my heart to yours, deepest sympathy. So sorry to hear about your loss, my thoughts and prayers are with you. I am very sad to hear about the loss of your beloved daughter Sarah. My thoughts and prayers are with you and your family. Dave and family, it is with a heavy heart I send you all my love and deepest condolences. I am so unbelievably sad for you and my eyes tear with yours. I can only hope you will find some strength and comfort in those who grieve with you. You are not alone. Some people have magnetic personalities; Sarah was one. Her spirit and energy were palpable in a room. Funny, outgoing, kind, caring, generous, smart, thoughtful, Sarah was so easy to talk to and so much fun to be around – I always looked forward to a visit or get-together with her as I was sure to be both welcomed and entertained. I admired the way she seemed to fearlessly jump into new tasks and adventures with both feet – I’ll miss her enthusiasm and zest for life. My heart is heavy with her loss, but I take comfort in knowing her beautiful light will continue to shine in everyone who met her. Much love to you Linnea, Dave, Rhiannon (and Kris!) and Chris. May our hugs be always a little longer and stronger, to keep Sarah’s memory alive. Our deepest thoughts and prayers are with your family on this untimely and unthinkable death of our beautiful Sarah. Sarah had this enthusiastic zest for life that drew her into the hearts of our extended family and everyone she met. Sarah had an immense generosity of spirit that she shared with all of us. Sarah’s, presence and participation in family gatherings, was always a positive influence and role model for all her cousins, nieces ,and nephews . We are comforted in knowing that thoughts of Sarah’s warm smile, big hug and endless energy will gradually fill the hole left in our hearts. We are so sorry to hear about Sarah, heaven now will be a better place with her there. We couldn’t have enjoyed her more when your family lived beside us. Dave & Linnea, my paltry words can not bring you comfort and ease in this suffering even though that is my deepest wish for you. Your beautiful girl Sarah, walked this earth as a proven gift and she will continue to be loved therefore, deeply missed. My heart breaks for you as I offer my deepest sympathy to your family. My deepest sympathy to your family. A beautiful life gone to soon. My heart aches for you at this sad time. I pray for peace and strength for you all to endure this heartbreak. My sincere condolences. May the memories of your precious Sarah sustain you through the difficult times. Love and hugs to you all. Sarah left an imprint on my heart, not only as my coworker, but as a beautiful friend with a wonderful heart. Her smile will forever make me smile. Thank you to her parents, for sharing her with us. She will never be forgotten. I miss her dearly. I knew Sarah from the Strathcona Wilderness Centre. She was a born leader with a kind heart, and never failed to bring joy to those around her. My thoughts are with those closest to her; just know you are surrounded by multiple communities that are here to show love and support. Our heartfelt condolences to all of you. Our son Dan sent us an email from Australia to tell us about Chris’s sister Sarah because we are currently in Croatia. The deep sadness you are feeling is being held in the hearts of the people who love you all over this planet. Chris often told us about the Prince family vacations and we were lucky enough to be invited to meet you at Chris’s home. May this loving connection surround all of you as you share stories about your daughter and sister Sarah. I am so incredibly heartbroken to hear of the loss of your vibrant and beautiful Sarah. Though I’d met her only a few times at Rhi’s boot camps, her light was undeniable. I will always remember her trying to convince us that the sumo squat was a good thing! I think I got more of a workout from laughing at the antics of Rhi and Sarah than the squats themselves! Please know that our whole crew is sending your whole crew so much love right now. To the entire Prince family, may you find comfort in each other during this insanely difficult time. Nothing can be said to make things easier but I hope in remembering her in life you all will all be able to keep her spirit alive forever. Thoughts and prayers to you and to everyone you love. I am sitting here remembering Sarah and realized there is literally not a single memory of mine where she doesn’t have a huge smile on her face. She was a kind, joyous person, through and through, and our hearts ache for all of you. Dave and Linnea, I am deeply saddened by the news of the loss of your beautiful daughter Sarah. My most sincere condolences. My knowledge and all my interactions with Sarah were thanks to my sister (Brianne Setzer). I knew from the get go that Sarah was an amazing person because she made my sister even more vibrant and wonderful. When I finally met Sarah there was not a single surprise, as she was as amazing as Brianne had said, people gravitated to her, her laughter was infectious and her constant love for everything and everybody was heart warming. I can’t imagine what you all are experiencing but I know someone amazing is gone physically but her stories will live on. Many hugs and warm thoughts sent to everyone who has been saddened by this sudden news. My deepest condolences to Linnea and family. My thoughts and prayers are with you at this difficult time. Dave so sorry to hear of your loss; my heartfelt condolences to you and your family. We wanted to let you know that we’re thinking of you and extend our deepest sympathy to you all. Sarah was always a joy to meet and to talk to on any occasion. Of course, her smile was priceless! To the family and friends of Sarah Prince, I would like to express my deepest and heartfelt condolences. I am truly sorry for the lost that your family is feeling. Experiencing the lost of a beloved family member is one of the hardest thing that any of us can go thru. And because of that my thoughts and prayers are with your family. During this extremely difficult time, please turn to God for comfort and support. He promise to give your family the strength needed in order to endure this great lost. (2 Corinthians 1:3,4) Something else that can bring your family comfort is cherishing the wonderful memories that you have of Ms. Sarah. These precious memories will console the family in the day’s ahead. My earliest memories of Sarah go back to Wes Hosford Elementary- she had an infectious smile and the warmest most kind spirit- I don’t think I ever remember her not smiling. Sadly we grew apart over the years, but clearly she touched many people in her short time here on earth. My condolences to the Prince family, may you find strength during this incredibly difficult time. Our deepest condolences to Dave Linnea and all the family. Dave, Linnea, Kris & Rhiannon, & Chris – we want you to know we are thinking of you and are sending you are deepest sympathy. Sarah was a delight to talk with anytime we saw her and her smile was so contagious. So sad to hear of your loss.Words are hard to find.Our families have been so close for so many years.The Lee family send their love and condolences at this difficult time.Sarahs spirit will live on. My thoughts and prayers are with the whole family. I loved playing indoor soccer with Sarah. She was always so positive and energetic and I will miss her dearly. I never met Sarah but I have a little sister myself as well as a daughter. Rhiannon and family, my heart aches for you. What joy she must have brought you, I hope you can find peace and keep her with you always. Xoxoxoxo. Dave and family, my deepest condolences for your profound loss. My thoughts and prayers are with you. Dave and family I am so sorry for this terrible loss. My heart is breaking you during this difficult time. Sending you all my love. Dave and Linnea I am really sorry to hear about Sarah’s passing – I pray that God grants you and the family peace at this painful phase in your life. I am sure Sarah’s light will shine in everyone’s heart who came across her. I am so sorry for your family, to lose your beautiful daughter and sister. This just isn’t supposed to happen. You are in my thoughts and my heart. I was deeply sorry to hear of Sarah’s passing. My heart goes out to you and my prayers are with you. I never had the honour of meeting Sarah in person. Heard many stories about her budding event planning career and the antics of her, Chris and Rhiannon through very proud father Dave. Her spirit is free and laughing and dancing through the stars planning for a super spectacular Prince reunion. Sarah. If you’re reading this it was far too soon you left us. That smile. That laugh. That energy. That integrity. That enthusiasm for life you can’t fake. That grace. And just being you. We may have only met occasionally but you were magic in every sense of the word. You made a tiresome triathlon work world into a joy filled event. You were a professional and dominated your job like the powerful women you were which made it a breeze for us. Those 8000 books we lugged! Those bloody car keys!! I know you made the day brighter for everyone you encountered. You’ll be sorely missed by your family and friends. You made the world a better place and anyone who was lucky enough to have met you is a better person. I count myself blessed that I met you Sarah. I’ll treasure that. Rest in peace. We are sorry to hear of Sarah’s passing. They say love conquers all, but this will take a long time for you and your family. Words can do so little but know that we are sending a million hugs your way. I wasn’t close with Sarah but knew her in high school and through friends. I always admired her kind, carefree spirit and positive energy. I am so sorry for your loss, I can’t imagine how painful this must be. Rest in Peace, Sarah. We met Sarah through our son when they were both in university and when they worked the events staff at the Oil Kings, as we were Founder Club members we would see her often. We will always remember Sarah for her quick smile that lit up her whole face, someone that smiles from inside. Our thoughts and prayers are with Sarah’s family and her friends who are all suffering from this loss. God must have needed more angels in heaven, as he took one from earth. My thoughts are with all of you at this sad time. My thoughts are with all of you ar this sad time. She was a sweetheart. Dave, I have no words to express my deep condolences. I’m thinking of you and your family. You are in my prayers. Dave and family. Please accept my heartfelt condolences. My thoughts and prayers are with you during this time. There are no words to make this right….we will miss you Sarah but know you are close to our hearts always. I will always remember you and Corey paddling around Crimson Lake will your muffin heads on! !